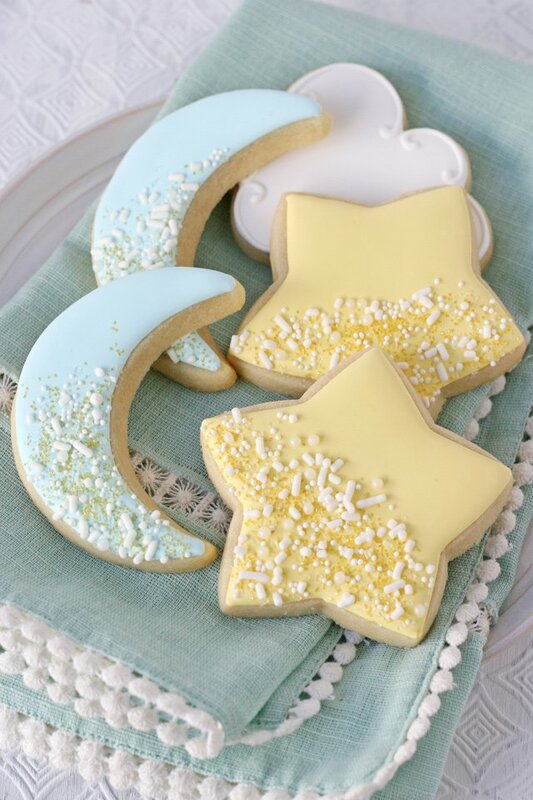 These sweet Star and Moon Decorated Cookies are a perfect treat to celebrate a new baby! In fact, they’re also perfect to celebrate TWO babies… which is exactly what my friend Lindsay over at Life Love and Sugar is expecting! Today I’m joining a lovely group of friends to celebrate Lindsay with a “virtual” baby shower! If you aren’t familiar with Life Love and Sugar you definitely need to hop over and spend some time there! Not only does Lindsay make the most beautiful cakes, cupcakes and treats of all kinds… she is just as sweet in real life as her desserts! When Lindsay shared that she and her husband are expecting TWIN boys (after struggling with infertility for several years), well that’s truly a reason to celebrate! 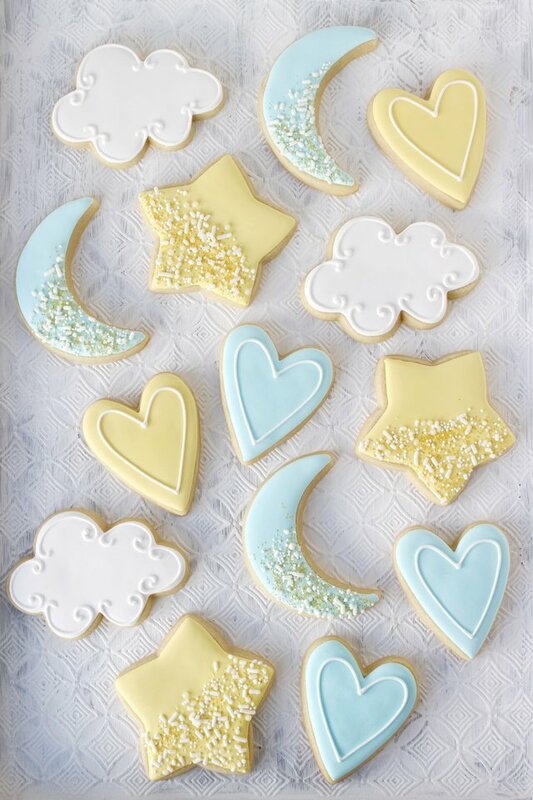 So let’s celebrate this sweet dream come true with these dreamy cookies! The designs I chose for this set are quite simple, but I just love how they turned out! Start with my Perfect Sugar Cookie Recipe. Prepare a batch of Royal Icing <– this link include my royal icing recipe and a basic decorating tutorial. Cookies cutters in your choice of shapes. I used a star, moon, cloud and heart. Gather assorted white and gold sprinkles. I made a little mix that included white jimmies, white nonpareils and gold sanding sugar. I prepared two bags of icing in each color (one outline/piping consistency and one flood consistency). Simply outline the cookie with the thicker icing, then immediately flood with the thinner icing. 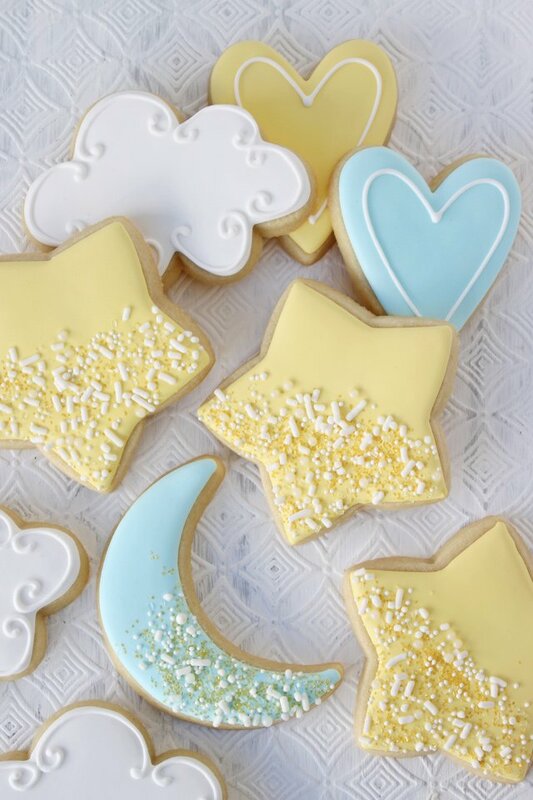 For the cookies with sprinkles (the star and moon), once the cookie is flooded and the icing is nice and flat and smooth, add your choice of sprinkles while the icing is still wet. For the cloud and heart shapes, which have some white detailing, you’ll need to wait until the base icing is set (1-2 hours) before adding the white details (using the thicker/outline consistency icing). 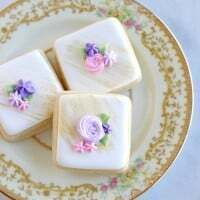 Read through my post with the Royal Icing recipe (same post linked above, with the supply list). This post includes a basic decorating tutorial. 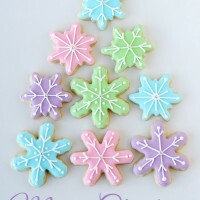 Watch the video in this Winter Wonderland Cookies post to see what the different icing consistencies look like. In addition to these dreamy cookies, many of Lindsay’s friends have created special goodies of all kinds to celebrate this special occasion! Happy baking, decorating and dreaming! My GOSH these are adorable!!! Glory, these are SO beautiful! Love them! Thanks so much for being a friend and celebrating these sweet boys today! These are precious. Your work is always above and beyond. Just beautiful!! 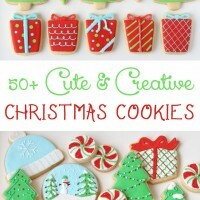 As always your cookies are gorgeous – and I know first hand they taste AMAZING!! Absolutely stunning Glory! You have such amazing talent… and speaking first hand you make the most delicious cookies! Girl, you are a cookie decorating rock star!!! These are fabulous looking!!! 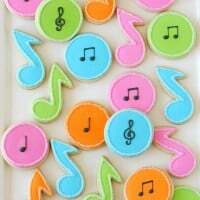 How sweet are these cookies – so great for a baby shower! Oh my gosh, these are perfect for a party!! !